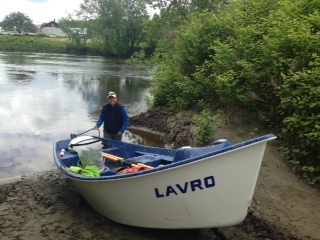 After reading up on the best place to start our trip downriver on the Connecticut, we opted for the “improved” boat launch in Lancaster. I think “improved” means that the grass has been pre-removed and any large rocks moved aside to allow a graceful descent into the 2 foot mud slide that will ultimately shoot your boat into the water hands free. Super creative engineering!